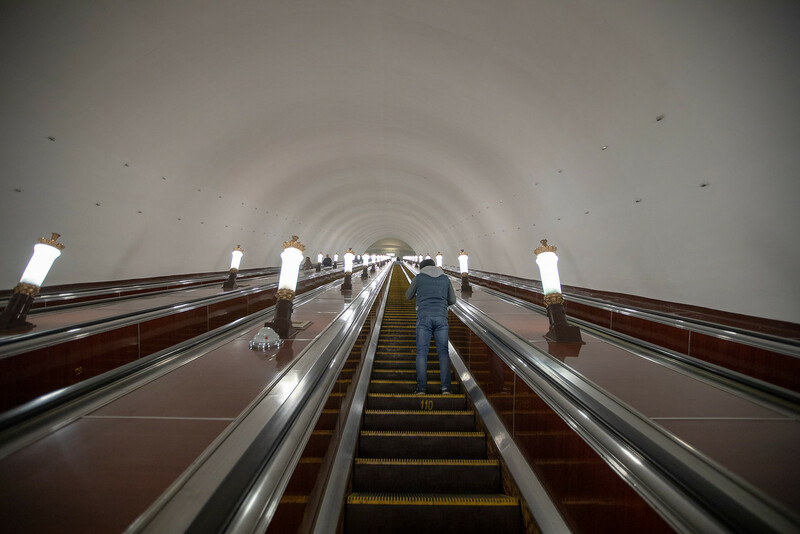 Is It Safe to Travel on the Moscow Metro? I Don’t Speak Any Russian, Will That Be a Problem? Don’t worry if you can’t speak or read Russian, it’s actually quite straightforward to get around Moscow on the Moscow Metro, and it’s very safe. Are There Moscow Metro Maps in English? 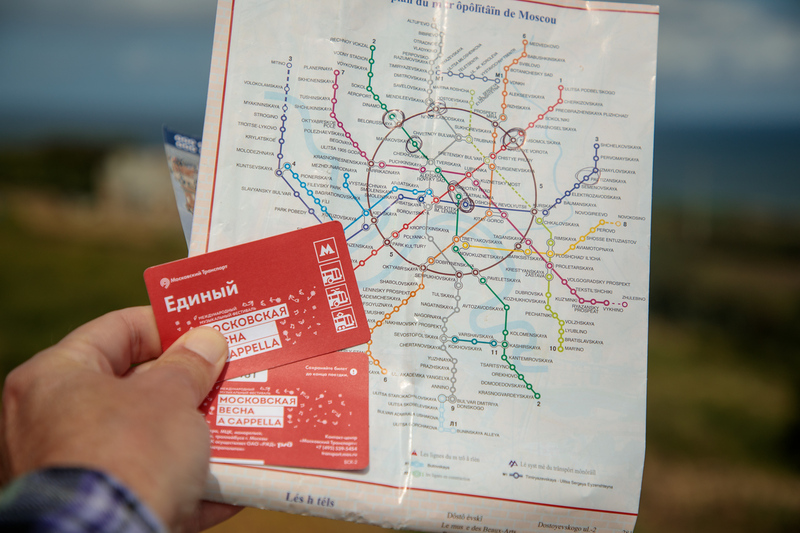 You can pick up a map written in both Russian and English of the metro system at any station, your hotel or download to your phone one of the many free Moscow Metro Map apps available online. What Are the Moscow Metro Hours? The metro runs daily from 05:30 AM to 01:00 AM. But like anywhere in the world, try to avoid travelling during the rush hour. It gets busy, and hey you’re on holiday, there’s no need to travel at peak times. How Much are Moscow Metro Tickets? 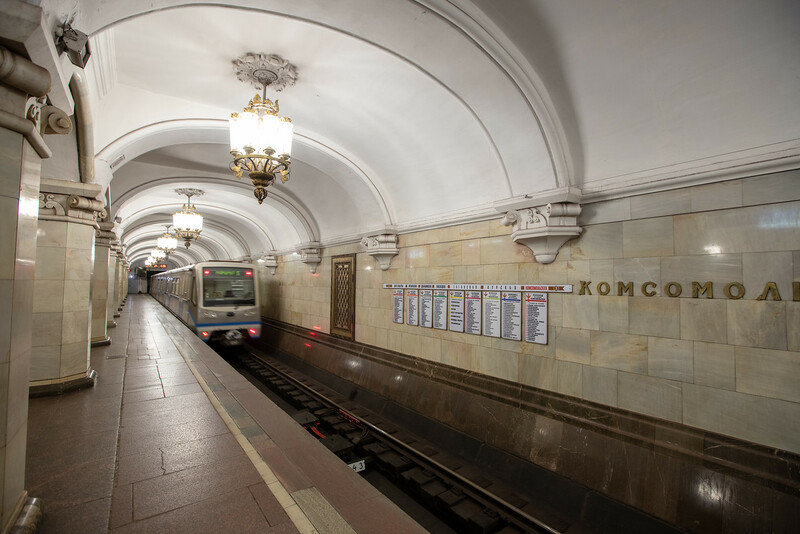 A single journey on the Moscow metro costs 50 rubles (around 80 cents), and you can travel to any station on the Moscow Metro network. There are no different travel zones like many other cities. 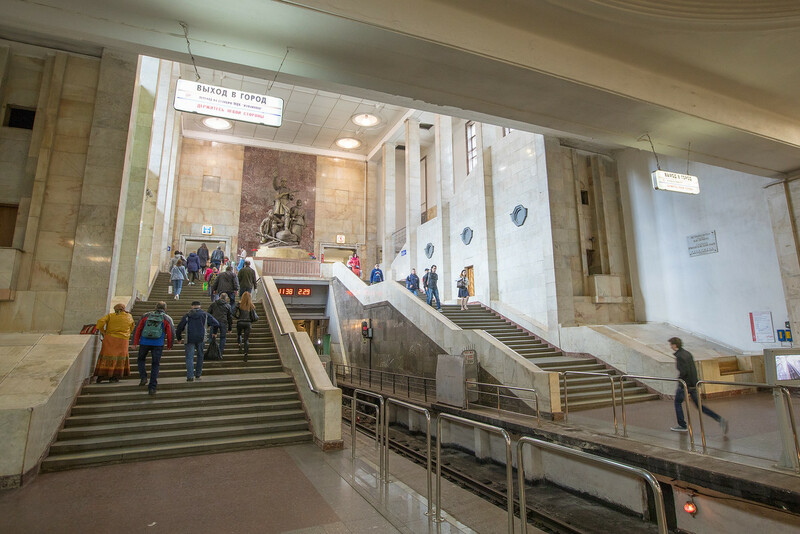 Nor is there a time limit on your ticket, so if you want to hop on and off all day taking photos of the fabulous artworks and statues found at Moscow’s metro stations, then you can. But the moment you exit a station, then you will have to purchase a new ticket to get back on board the next train. How Will I Recognise That I’m At a Metro Station? Metro stations are easily identifiable by a giant red M outside the station. How Do I Buy a Moscow Metro Ticket? Buying a ticket is pretty straightforward. You can use the ticket machine which does have an English language option or purchase a ticket at the ticket counter. The ticket counters are called KACCA. Most staff at all the ticket counters that we used did speak some English, but if they don’t, then just smile and indicate the number of tickets/journeys you need using your fingers! It’s easy, honest! It’s worth noting that you can buy a ticket for ten trips or so and share it with friends and partner, there’s no need for each person to have an individual ticket. Once I’ve Got My Moscow Metro Tickets, What Do I Do? Once you have your ticket, pass through the turnstiles, some stations are more modern than others, but you just place your ticket on the card reader and then head down to the platforms on probably what will be some of the longest metro escalators you will have ever seen in your life. How Do I Know Which Mosco Metro Train to Take? At the main metro stations, most of the signs indicating which direction the line is travelling in are written in both Russian and English but NOT at all stations. It is, however, easier than you think and quite fun to try and read Russian, and surprisingly I managed to decipher correctly 100% of the time and if I can, anyone can. It may just have been a sheer fluke though!! But don’t worry if you jump on the wrong train or miss your stop, trains run so frequently, just hop off at the next stop and change trains. How will you know if you’re on the wrong train, well once you are inside the carriage of the train, the maps and announcements are made in both Russian and English. What is the Cost to Retire Overseas? 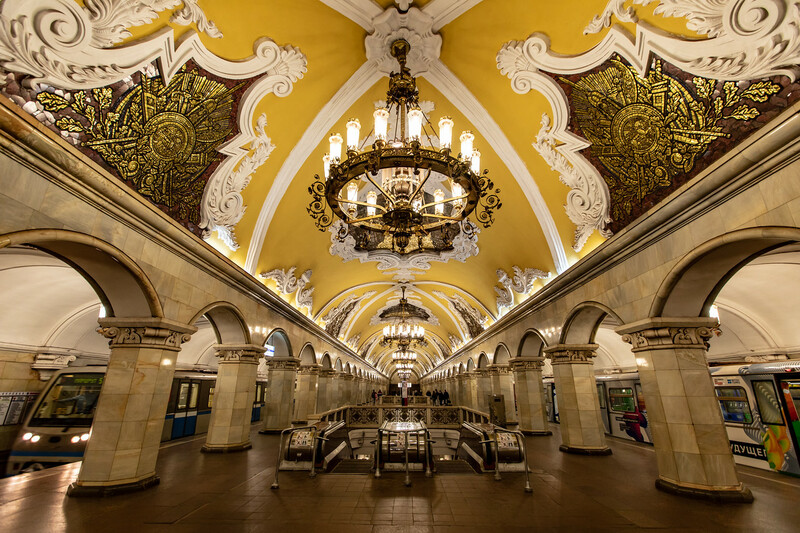 What Do I Do if I Have to Change Moscow Metro Lines? If you need to switch metro lines when you exit the train just follow the signs in the colour of the line you need to take. With a single ticket, you can change lines as many times as you want. There’s no need to rush if you hear a train coming, the average frequency is 90 seconds, even more, frequent in the central stations. Are The Exit Signs Written in English? Once you arrive at your destination, simply follow the exit (Way Out) signs. Yes, the exit signs are usually written in English (especially near Red Square and the Kremlin) as well as Russian (Выход). The larger metro stations will have more than one exit, so choose one closest to your final destination or do what we do, pick one at random and see where it takes you. After all, travel is an adventure! Riding the Moscow Metro is a Unique Experience in Itself. Yes they do. We have a blog coming soon just about that!